Slightly larger than the size listed in the table, this stock fits tightly in a keyway. Made of steel, it is an economical choice with high strength. Use it to create a machine key at the length you need. Zinc-plated steel stock has good rust resistance. 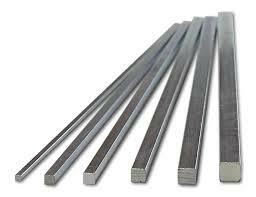 High quality steel material. Zinc plated finish. Size is clearly marked on each piece. Keystock is used to provide driving torque between shafts and pulleys, gears, sprockets, etc. Used for new machinery, general maintenance, and shop repairs. It is a necessity in all applications where rotating power devices are used. Most tolerances on dimensions are oversized to assure tight fits in keyways for positive, zero backlash power transmission.